As early as June 2014 an international working group of the World Security Network has started to draft options for a possible solution of the conflict in a White Paper Ukraine (see details here). The proposal to copy the best practice of autonomy from Trentino-Alto Adige/South Tyrol for the Donbass in East Ukraine has reached the mind-set of the Russian President. It was promoted to him by Italian Prime Minister Matteo Renzi and mildly welcomed by Vladimir Putin as a „valuable suggestion to resolve the situation". There was three hours of discussion in Moscow on March 5th, 2015 - mainly regarding the EU-Russia-crisis involving Ukraine. 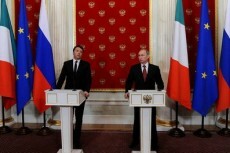 Afterwards Putin and Renzi gave a joint press-conference to review their discussions and proposals. The Italian Prime Minister said: "I think that it would be worthy to highlight the crucial step forward made" regarding the signature of the Minsk Agreement. "We will work to implement the statements of this Agreement. Europe and Italy can become a reference point". Italy in particular, according to the Prime Minister might „provide all possible support for a solution concerning the crucial request of a new status and a wider autonomy to be granted to the Eastern Ukrainian Regions held by the separatists. We have had a wonderful experience in Trentino -Alto Adige (South Tyrol).This is an excellent example of how you can successfully solve the problems of decentralization." "We agree that both the parties have to respect the Minsk Agreement, paving the way to a peaceful solution" stressed Russian President Putin, who added the need for a wider political dialogue involving the rebel strongholds of Donestsk and Luhansk as well: "We expect Italy, in its national capabilities and as major European Union member, will play a key role in this process", he argued. Putin told the media: „The Prime Minister made a number of valuable suggestions about what could be done to resolve the situation in the future. The situation there remains difficult. But we at least have to stop fighting, not killing people, not destroying the cities." The conflicting parties should comply strictly with the agreements reached in Minsk. "I count on more active help of the EU." During the course of eight months the independent World Security Network has developed concrete steps to help cool down the Ukraine conflict in a detailed White Paper Ukraine with input by a working group involving experts from Ukraine, Russia, Italy, Austria, Germany and other countries. Based on best practices in Europe, the World Security Network has lobbied for creative solutions for the Ukraine crisis and has promoted it to senior advisors involved in the Minsk process, to several members of parliaments, the foreign ministers of Germany and Austria, the Russian President and experts in Moscow as well as Ukrainian advisors and politicians like Wladimir Klitschko and several US officials. The White Paper Ukraine is based on five main elements: 1. A copy of the Trentino -Alto Adige (South Tyrol) Accord from 1971 for a maximum autonomy in the Donbass within Ukraine. 2. True reconciliation and implementation of the Codes of Tolerance for all minorities in Ukraine. 3. A Reconciliation Referendum for Crimea, as done by Germany and France in 1955 for the disputed Saarland. The people on Crimea should decide freely under UN/OSCE control whether to be within Ukraine of Russia. 4. An integration of Russia in the EU-Ukraine-Trade-Agreement and 5. A fresh dialogue and re-set of NATO-Russia Relations.